The frequent tribal unrest and occasional outright war has hindered most to visit Kalinga Province. Today, these concerns have been eradicated as the preserved rich culture has been slowly known and opened to mountaineers, travelers and tourists. In a few steps from our transient abode - the Riverside Inn of Luplupa Village - breakfast was prepared by its caretaker, Mang Johnny, at his home. It was an unusual way to start the day for me, not being a coffee drinker, as I sip on a cup of freshly brewed Kalinga coffee almost tasting like chocolate de batirol. And it was good. Indeed, the best way to start the all-day affair of traversing the mountain villages of Tinglayan. Tinglayan is one of the municipalities of Kalinga Province where highlanders and prolific rice terraces builders and farmers dwell. Riverside Inn and Mang Johnny’s home has a mural of Tinglayan’s map, causing a swift plotting of our itinerary. The cool breeze that hover and the sounds of the rushing water of Chico River was a comfort as we commence exploration of the villages of Tinglayan. It was an everyday affair to cross a long and narrow hanging bridge over the Chico River. With my fear of heights, I am left with no recourse but to face it every day. The Riverside Inn is in Luplupa Village which means I have no choice but to cross the same - slowly and safe. I wish I could have placed a placard at my back which says “You can overtake me” as locals and other travelers wait and follow my pace. The bridge is on quite a high elevation which I refused to look down. Crossing at nighttime proves to be more relaxing for me though. The hanging bridge connects the village to the national highway. From that vantage, the strong current of the river is apparent yet the landscape is still. It is in Luplupa Village where you get to be close with the most extensive river in the Cordillera Region, the Chico River. Referred to as the "river of life", this major tributary of the Cagayan River is also a site for whitewater rafting during the rainy season. After the dreaded stint of crossing a hanging bridge, we stayed at a sari-sari store which serves as the landmark entrance to Luplupa. The jeepney bound for Bontoc (PhP20.00 fare) is parked at the front of the sari-sari store and leaves at around 8 in the morning daily. We informed the driver that we be dropped-off at Mar-O, at the junction of Bugnay village as we are headed to Buscalan. At the junction of Bugnay village is a small village named Mar-O. 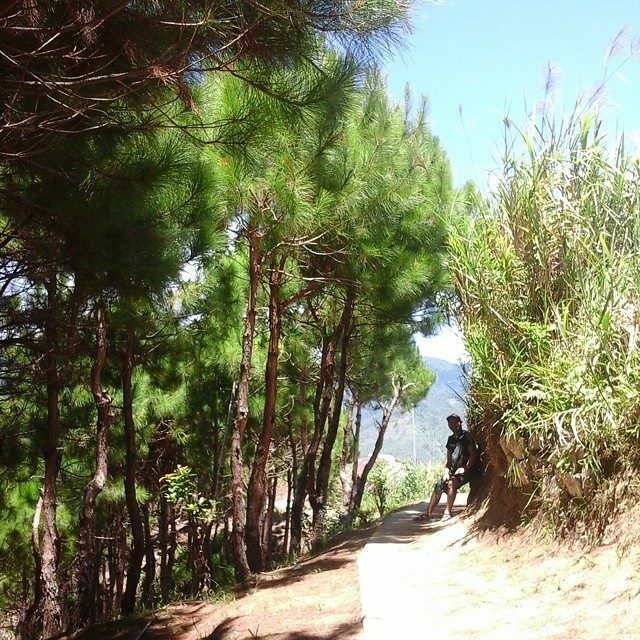 This will be our gateway to Buscalan as we ride a tricycle (PhP100.00 fare) for an ascend instead of walking for hours. We stayed at the said village for a number of hours the day before as we waited for the jeepney that took us to Luplupa. Bugnay is also connected by a hanging bridge to the national highway. It is more scenic however, with the rice paddies and terraces as its imposing landscape. 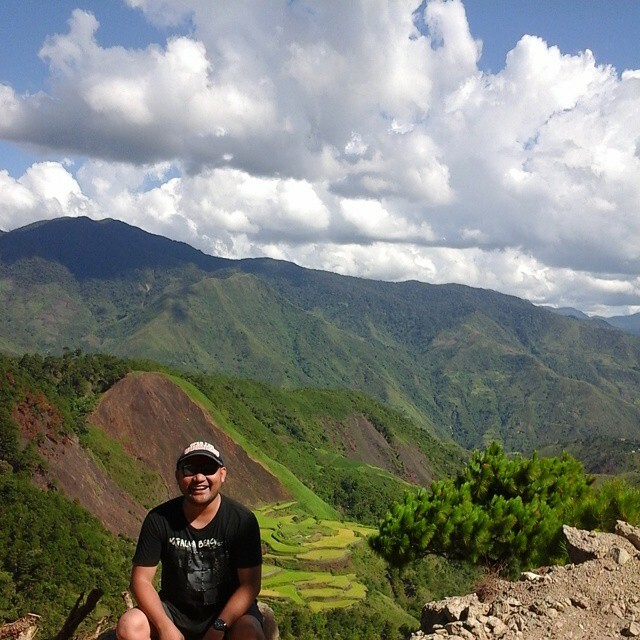 After a few minutes, the motorcycle ride to the entry point of Buscalan commenced. It was fast. Our travel time was surely cut-off. Home of Whang-Od, the last traditional Kalinga mambabatok (tattoo artist), the hidden village of Buscalan is the most famous, if not the only known village of Tinglayan. But there’s more to Whang-Od and getting inked when in Buscalan. The trail commenced with a 360-degree panoramic view of rice terraces, forests and endless mountain ranges. There is a ropeway conveyor for cargo and other goods amidst the said landscape. According to Moises, our guide, it costs 1 peso for every kilogram. How about if I go inside that conveyor? The trail was defined and at times concrete making it relatively easy. Despite the voluminous perspiration I had, the walk was quite refreshing as the air we breathe is fresh. The scenic landscape adds up to a level of walk in the park at times (but more often not). The hike was even made manageable in the company of my travel buddies and our guide, Moises. We passed by a “mini” waterfalls before ascending further. It was a scenic refuge. There’s a potable water source to keep us hydrated at all times. Water bottles were filled-up before we continue the hike to Buscalan Village. Varied types of trees exist and infinite mountain ranges surround us as we move to a higher elevation. As soon as we arrived at the village, one of the houses at its forefront is that of Whang-Od. There’s a signage that declares the same to be hers with a photo printed in tarpaulin. 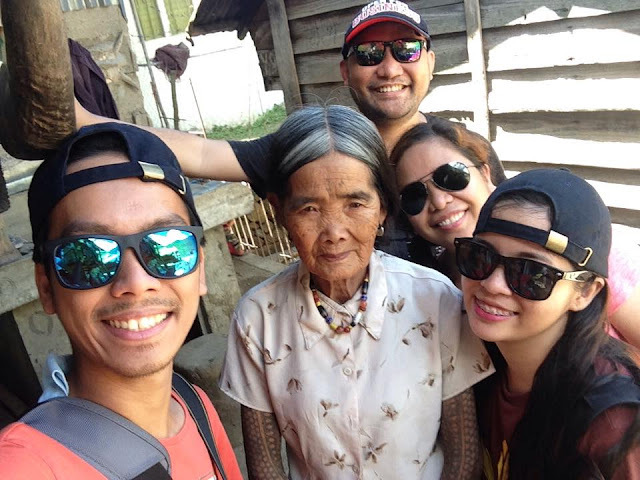 To achieve the order of business, we searched for Whang-Od and she was on a tattoo session at the house of Grace, her niece. It was a long weekend and so as expected, there is a long queue of tourists who desires to be inked by the last traditional Kalinga tattoo artist. Others stayed overnight at the nearby houses hosted by the residents. 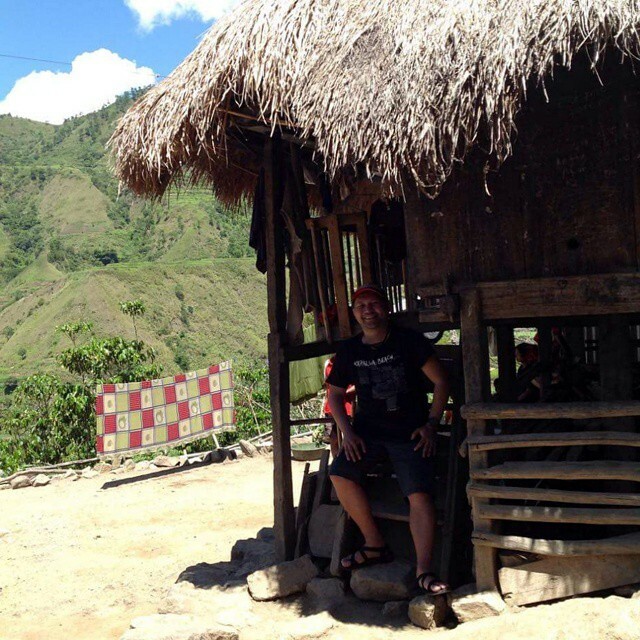 While seated in one corner to rest, we were offered brewed Kalinga coffee by the residents of Buscalan. 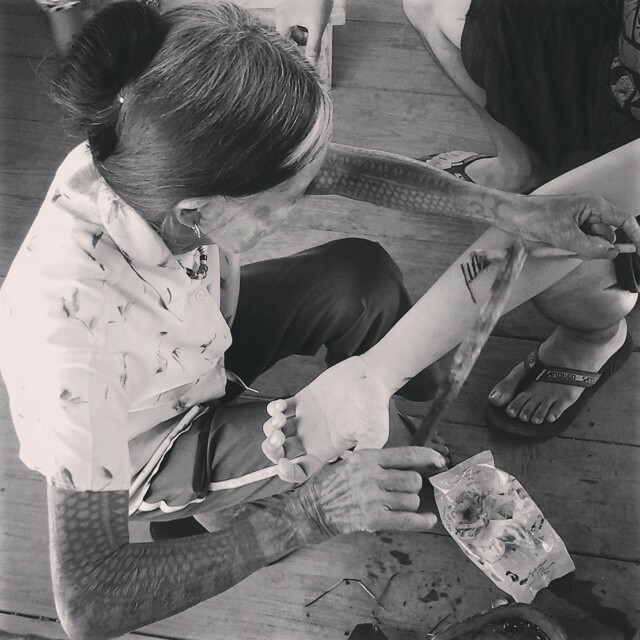 Armed with a small bamboo hammer, large citrus thorns and a charcoal, Whang-Od has immortalized the tradition of the Butbut tribe in tattooing. Inasmuch as you would want your own design as tattoo, these are pre-designed as it resembles personas and characters of the ancient times. Costs may vary and minimum is around 400 pesos. The 95-year old Whang-Od does not look and act her age. She is a slender and petite woman, not to mention quite energetic, showing no signs of retirement anytime soon. Locals in the community however shared that this might be the last year for her to practice mambabatok since eyesight is slowly degrading. But with passion for the said art, no one knows actually when she will retire. We had our lunch at the house of Whang-Od’s niece for free through the initiative of our guide, though we have given a certain amount of cash as token. In what appears as ginataang langka (young jackfruit in coconut milk), the dish is purely boiled with no seasonings. 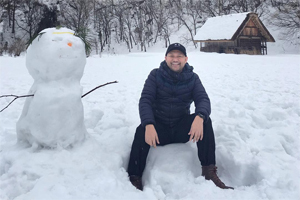 One must be reminded that there are no supplies of seasonings up in the mountains, so you can bring canned goods if you have a preferred dish and quite picky. The bland dish nevertheless will do for us at that moment, to be able to continue our journey on two more villages. On midday, we continued the hike towards another village situated at the topmost of the mountains of Tinglayan. Harvest season coming up, the panoramic rice fields in terraces came into view. More ascents came our way. From the top vantage, the cascade of rice terraces from the slopes with surrounding infinite mountain ranges under the blue skies was a perfect panoramic view complemented by the village of Buscalan which sits in the middle. It was a postcard worthy scene that I have witnessed. I have never hiked on midday with such a relief. At times my knees would shake from exhaustion, but I have to move on. I hiked at my own pace. I had an improvised trekking pole in the form of a solid tree branch which makes my hiking experience bearable. Fortunately, in less than an hour we were at the peak of a mountain where a cold breeze greeted us despite the expected scorching heat of a midday sun. Pine trees surround as we get near the rural village of Loccong. “Welcome to the happiest village,” uttered by the barangay captain as soon as we entered the village with an enclosed fence as if shouting of exclusivity. Our guide, Moises, has so many friends in this village and children were calling him. I even thought I was the one referred to by the children as I was carrying a solid tree branch to aid my walk. “Moises, Moises!” the children summon and follow us as we roam around the village. Peaceful and laid-back atmosphere with aligned traditional wooden houses marks the village of Loccong. I remember a traditional Loccong house being displayed at Tam-Awan Village in Baguio and I was at awe. And now, I am actually at Loccong having a grasp of these traditional houses. After a few minutes of rest, we decided to walk towards the Butbut Proper. The dirt road to Butbut Proper has a more relaxed trail. We could see from our vantage where we have started the hike and I can’t count the number of mountains we have passed (or I refused to). Enroute, we have passed by laborers and even the trail smells of dynamite. The road is a new one – still to be paved. With a guide familiar with the route and the people, we know we are safe. For hours of walking, we finally made it to Butbut proper. We had snacks served at one of the houses while we await for the motorcycles (PhP150.00 person) that will take us back to the Poblacion then to Luplupa. We loitered for hours and there was no mobile signal. I sat down on one corner as I observe how life unfolds on one afternoon. Life is so simple. After the sun sets, we traversed the mountains of Tinglayan on board the motorcycle on total darkness with only the headlights on passing by long and winding dirt roads of unknown depth of precipice. OMG! Whang Od! ang mura ng singil nya for the value of her works. All in all, how much did you spend for this trip? Just the estimate. All in all, how much did u spend for this trip? Just the estimate.